For our off the shelf 360 degree feedback surveys you will have access a range of off the shelf individual and group reports to give you the information you need in the way you need it. For bespoke surveys we will build a bespoke report based on our standard templates below but will tailor the report so that it is bespoke to your needs and your organisation. These have been designed by our experienced consultants in order to ensure the individuals receiving feedback can quickly understand their feedback. The reports encourage the individual to consider how they can make use of their strengths and recognise where their behaviour and actions may be having a negative impact. 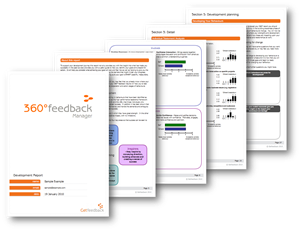 Find out more about our standard 360 feedback reports. This would be used in a situation where an experienced facilitator would be delivering the feedback – taking the individual through the report and helping them to understand the key messages within the report. It contains all the key information, represented graphically, but lacks the contextual information that would enable the individual to interpret this report on their own. 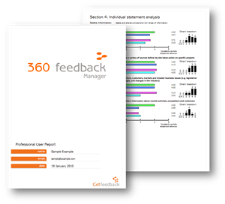 View a sample professional user 360 report. This report contains guidance and information to contextualise the information with the report. It presents the data graphically so as to aid the individual’s understanding of strengths, areas for development and blind spots. It has been designed, based on our knowledge and experience of behavioural change, to maximise the chances of the individual taking action and successfully changing their behaviours. 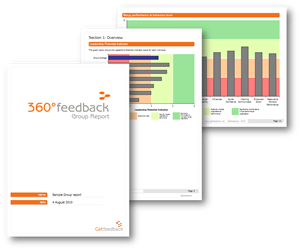 View a sample development 360 report. Benchmarking can be included in our off the shelf reports for an additional cost. Our benchmark data is built up of a large amount of 360 data for managers, leaders, and individuals from a range of business. Benchmarking aloows you compare an individuals results not only against the feedback given by thier nominees but also against thier peers within external organisations. 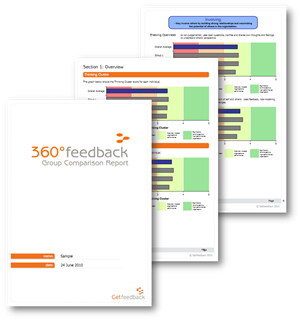 Find out more about our 360 feedback benchmarks. View a sample development 360 report including benchmarks. We also offer 2 group reports to allow you review the strengths and developments needs of a team as or whole, or to compare groups of individuals to make it easy to ensure your development initiatives have the most impact. Contact us to find out more about our 360 degree feedback reports or discuss your reporting needs.